Imagine an algebra problem with potentially fatal consequences: a train leaves the station going 35 mph, with stops. Thirty minutes later an express train departs on the same track going 35 mph, no stops. Will the first train reach an exit at mile 25 before the second train catches up? On Sunday evening, November 26, 1905, the answer was "No." Although trains had been around for more than fifty years, train safety was still an evolving process. At the time of this accident some systems had electric-powered signals - semaphore arms by day and lights by night - to signify that another train was ahead. Additionally, if operators on a leading train thought there was a chance a following train might catch up, a flagman on the rear car (not always a caboose) would periodically throw red 'fusees' (flares) off the back. These were designed to burn for about ten minutes. And that's it for preventing rear-end collisions. No real-time train tracking, no radio communications between trains, and no collision avoidance automated braking. 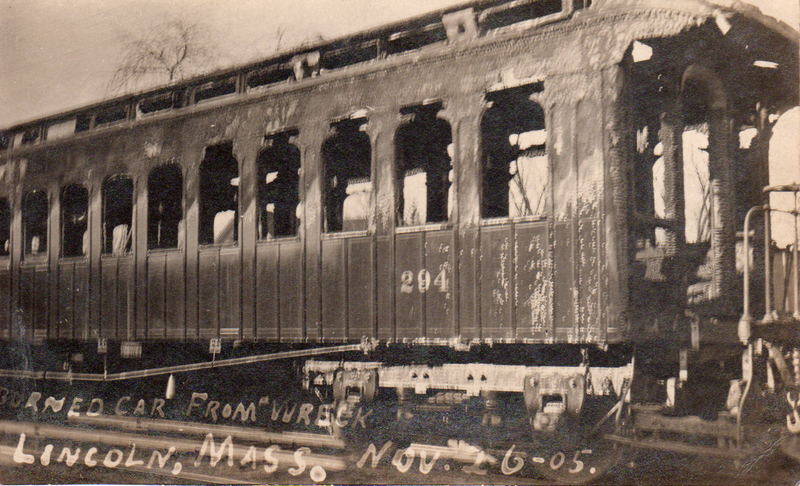 The players: Boston & Maine Railroad ran local-stop passenger trains between Boston and Marlborough, using the main line to south Acton, where the trains would switch to tracks serving Maynard, Stow, Hudson and Marlborough. The night of the accident, the train, comprised of an engine, a tender and four coaches, left Union Station (same site as current North Station) at 7:16 p.m., making stops all along the way. Scores of people were returning to Maynard after Sunday excursions in Boston. Most were on the last car, as it was designated to be left behind at Maynard before the rest of the train continued onward. Behind it, the overnight Montreal Express - two engines, two milk cars, two baggage cars, a mail car, a Pullman car, a smoker and two coaches - left Union Station at 7:45 p.m. The local was running late and the operators were aware of what was chasing them from behind. At the evidentiary hearing the flagman reported he had dropped fusees east of the Lincoln station, west of the Lincoln station, and again a goodly distance before the Baker Bridge station in western Lincoln. According to the report from the Board of Railroad Commissioners, Horace Lyon, the engineer of the lead engine of the express stated that he had seen the fusees, and had cut back power, but at most only lightly applied brakes. The night was in general clear, but there may have been some obscuring night fog in Lincoln, near the Sudbury River. Regardless, Lyon testified that he did not see the rear lights of the stopped train until within 100 yards, and even with emergency brakes, could not stop in time. The conclusion was operator error on the part of Mr. Lyons. There was discussion about him doing a night shift when he had just completed a day shift, but the major fault was identified as lack of experience. Lyons had only recently been promoted from fireman. Prior to the night of the accident his experience was a few weeks in the switching yard, a week driving freight trains, and this only his second day in charge of a passenger train. Although he had experience as a fireman on the Montreal Express, he may not have been aware that the local had an optional stop at Baker Bridge, 1.5 miles after the Lincoln Station stop. Lyons was only slightly injured in the accident, and fled the scene immediately after the accident, and when located later, was described as being in a state of mental collapse. Newspaper reports of the time reported the accident as occurring at 8:15 p.m., and resulting in 17 dead and 25-30 seriously injured. Two of the dead were fireman on the Montreal-bound engines. The others were passengers on the rear two cars of the local, either killed in the accident or from the resulting fire, set by the lead engine of the express. The death toll would have been higher except for railroad employees and passengers from both trains braving the smoke and fire and risk of a boiler explosion to extract the trapped and wounded. The Barris's were father and son; the Carlson's husband and wife. Albert and Elfrida (Collins) Batley, married just two years, were among the injured. Mrs. Batley lost part of a leg. The couple were later owners of Batley & Son Florists, with more than 7,000 square feet of greenhouse buildings on Acton Street, behind the Fowler funeral home. One question the Commissioners asked - if the train was stopped - why not send the rear flagman back on the tracks to flag the oncoming train? Or at least put some torpedoes* on the rails? This would have been the approved practice if the local train had broken down and could not proceed. But that was not the case. The local had just dropped off passengers, and was expected to be underway again within minutes. Being off the train would have separated the flagman from his train. On a different note, a U.S. report circa 1905 - meaning before the era of cars and trucks and buses, there was an estimate that train and trolley accidents were responsible for approximately 10,000 deaths and 100,000 injuries each year. Currently, rail-related fatalities average around 1,000 per year, the great majority being a combination of people walking along or crossing tracks and vehicles hit while crossing tracks. 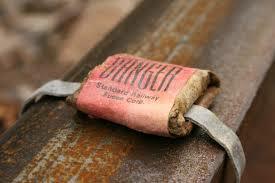 *A "torpedo" was a small metal packet, about half the size of a business card, filled with gunpowder. When a train's front wheels hit one, it would explode, thus warning the engineer of danger down the track. The torpedo was attached to a strip of lead four inches long. When the torpedo was set on the rail the lead would be bent down on either side in order to hold it in place. Several of these might have been placed on a rail to make sure the following train got the warning. Railroad workers being railroad workers, torpedoes were central to various practical jokes. Carnegie is a name oft-associated with public libraries. Steel industry tycoon Andrew Carnegie decided to use his wealth for the public good in his lifetime. He established a system by which municipalities could apply to him for funds to build a library if the city or town promised to buy the land and commit to an annual budget greater than ten percent of his gift toward construction costs. By the time of his death in 1919 he had gifted over $350 million dollars ($13 billion in today’s value) to many causes, including more than 2,500 libraries, two-thirds in the United States. A Carnegie gift led to construction of the public library in Hudson in 1905. Local benefactors were often instrumental in start-ups of local libraries. William Wilde of Acton paid for construction of a library in memory of the Acton citizens who had fought in the Civil War (hence Acton Memorial Library). William Munroe paid for the Concord Free Public Library. In Stow, John Witt Randall donated a collection of 700 books to start a town library in 1851, and later bequeathed the money used to build the original parts of the present-day Randall Library in 1894. Similarly, in Sudbury, John Goodnow II, who died in 1851, left land and funds to build the Goodnow Library. The 1851 date is important. In May of that year the state of Massachusetts passed an Act to authorize cities and towns the right to tax occupants one dollar per year to create a public library and twenty-five cents per year in subsequent years for operation expenses. Personal and business bequests and donations were allowed. By 1870 there were eighty free public libraries in the state, all pre-dating Carnegie's impetus. In Maynard there was no significant benefactor. The Town appropriated $1,000 in 1881 to start a library, located in a room in the Acton Street School. Subsequent annual budgets were in range of $500-600 per year, mostly for more books. The library was open two evenings per week. A few years later it was relocated to rooms in the Riverside Cooperative Building, at the site of what is now the Knights of Columbus building, then in 1918 to second floor rooms in another building on Nason Street. Only in 1962 did the Maynard Public Library get its own building, next to town hall. Forty years later the demands for library services called for a much larger facility than could be provided at the Main Street site. After consideration of many options a decision was made to utilize the Roosevelt School building at 77 Nason Street. This elementary school opened in 1918, built on the 1892 stone foundation of what had been the wood-framed Nason Street High School, completely destroyed by fire in 1916. Roosevelt School existed from 1918 through 1988. The building then stood empty, deteriorating, until a combination of state grant, town tax funding and private donations - the last accomplished by efforts of the Friends of the Maynard Public Library - combined to total the $5.7 million needed for this project. Middlesex Savings Bank was a major contributor with a gift of $100,000. The plan from the architectural firm Lerner | Ladds + Bartels was to retain the entrances and brick walls of the school building but construct an entirely new structure within the exterior shell. The result is a three story, 24,000 square foot building with an open core and stairwell, naturally lit from above via skylight. An anecdote: during the empty years, the Town of Maynard used the building to store all lost bicycles that went unclaimed by owners. Some towns have annual auctions of unclaimed bicycles - sold "as is." Not here. When the building was being cleared prior to start of construction, an open topped waste container 6x8x22 feet (30 cubic yards) was filled with bicycles. Twenty-first century libraries are so much more than books. Over time, libraries added adult reading rooms, newspapers and magazines, children's rooms, story time, meeting rooms, used book sales, use of computers, access to internet, movie nights, guest speakers, education programs, museum passes, loaning out e-books, movies and music, and so on. Inter-library book transfers allow libraries to have smaller collections on site, yet still provide access to the larger world of books. Maynard's library also uses the first floor meeting room for art displays and a glassed cabinet on the second floor for historical displays. The third floor is for children's programs. To the left of the entrance is a red cicycle rack that spells out the word "BOOKS." Between in and the door is one of Maynard's fire alarm call boxes. Visit http://www.maynardpubliclibrary.org/ to learn more about what this library provides. Annual reports mention 1,893 books in 1885 and 3,416 books in 1891. Fifty of David Mark’s 2012-2014 columns were published in book "Hidden History of Maynard" available at The Paper Store, on-line, and as an e-book. And at the Maynard Public Library!